Luxurious 4BR Home-1 Block (150 Steps!) from the Gondola! The calendar really is up-to-date, so you can click on the 'Calendar' button (at right on VRBO and above on HomeAway ) to see if I'm available! * Gorgeous finishes -- built in '08 ... Check! * Just 150 steps from the gondola ... Check! * Flat screens, Blue-ray DVD players, and iPod/iPhone docks in every room ... Check! * High thread count on every bed ... Check! * Steam shower in the master bedroom suite ... Check! * High-end open kitchen with Viking and Sub-Zero appliances ... Check! * Large living room with deck facing town and awesome views of the canyon ... Check! * Plush and lush ... um, double check!! You're coming all the way to Telluride ... why not let us spoil you? This luxury residence is in the heart of town -- the 'Depot' area -- just steps from the Gondola and the ski slopes. This elegant and sophisticated four-bedroom home lives and feels like a single-family residence and offers framed views, open living spaces, quality custom construction and high-end finishes and fixtures throughout. Part of a complex, the North Residence has primary access from Pacific Street. An open kitchen and living area with high vaulted ceilings, gas fireplace, half bath and spacious deck occupies the entire top floor. The luxurious master suite, mud room and main entry reside on the main level, and three guest bedrooms and two bathrooms share the entire lower level. 2,200 sq. ft.
We wanted a home with top-quality finishes and a 1-min. walk either to the gondola and Lift #8, or to the shops and restaurants on Main Street. We found just that at 408 Pacific in Telluride. Voila -- welcome to our home in paradise! From our home: * Walk about 1 min. southeast to the gondola and lift #8 ... or ... * Stroll about 1 min. to Telluride's famed Main Street for shopping, restaurants, and then on to Town Park ... or ... * Meander about 1 min. over to the beautiful river trail that flows for miles alongside the San Miguel River ... You're in the middle of all that beautiful Telluride has to offer. What's not to love?! toilet, tub, shower, Steam shower! ... full-size tub ... and heated floors! In-floor heating throughout the house! High ceilings, views all around, and plenty of comfortable seating! High-end kitchen, with Viking and Sub-Zero appliances. C'mon up and cook 'til your heart's content! Table seats 8, plus 2 + counter-top seating. We also provide Apple TV, so you can log in to your Netflix or iTunes account for movies, etc.! With a Blue-ray player in every room, enjoy our DVD library -- About 50 of our family's favorites, from action and drama to romance, family and kids' favorites! Free locking ski and snowboard racks on the side of the house! What a great place to stay in Telluride. Not only is the house amazing but the location certainly can't be beat. We skied every day and it is about as close as you can get to the gondola or chairlift. The walk to anywhere in town...restaurants, shops, market is just blocks. The house itself is beautiful...spotless, with lovely, high end furnishings. Our host, Charlie, and manager, Amy, were both welcoming and so helpful. Don't think twice about renting! We were returning guests and will return again. 408 W. Pacific is spacious, well appointed and ideally located. The owners have thought of everything to ensure a positive experience from booking through departure. We have stayed with 4 and 5 single adults with luxurious comfort and no complaints. Highly recommended. Very nice place, we highly recommend staying here. Our group originally had a debate about "staying in town" vs "Ski In/Ski out". If you are also struggling with that decision, you should stay at this place. 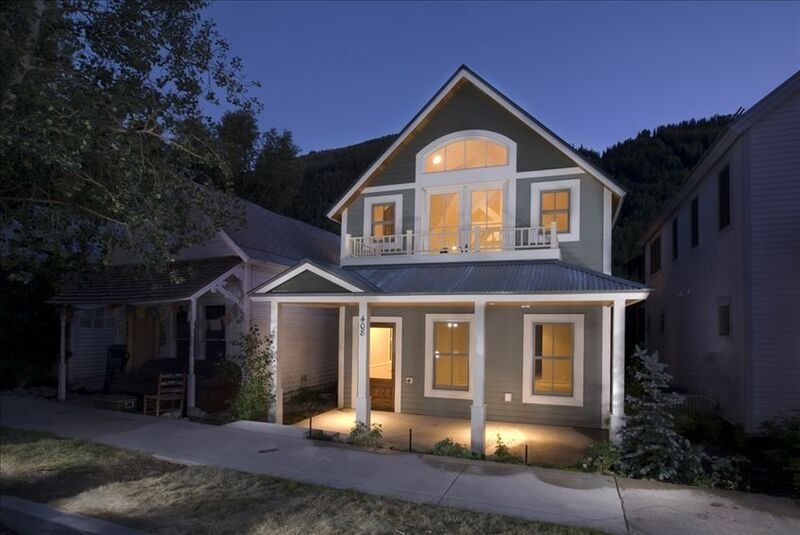 It is a VERY short walk to the gondola, plus you have all the benefit of being a few short blocks from downtown Telluride. The house is extremely well kept, very modern, and the owners are very open and communicative. When we go to Telluride again, we are definitely staying here. Beautiful, spacious house that was well supplied...location could not have been better... We will be back! This is the second time we’ve stayed in this beautiful home and we couldn’t be happier! The location is key and the home is lovely. We had a wonderful time at the house. It was well appointed and very conveniently located. We would love to stay again! Everything is disclosed up front. No extras or surprises -- promise! Rates are subject to change until reservation confirmation.